Southern Tier seems to have fallen from the vanguard of the beer nerd scene (you can only drink so much Pumking, you know), but offerings like this could certainly make some waves with jaded dorks on the prowl. It's an English style barleywine aged in a trio of barrels. A third of the blend was aged in bourbon barrels, another third in bourbon barrels that once held maple syrup, and the final third aged on charred oak staves used in Southern Tier's distilling program to create whiskey. There's a large community dedicated to investigating the existence of the legendary sasquatch, but did you know that they refer to their investigations as "squatching". I'd call it kinda dumb, but then, I wait in lines for beer. Fortunately not this beer, though. 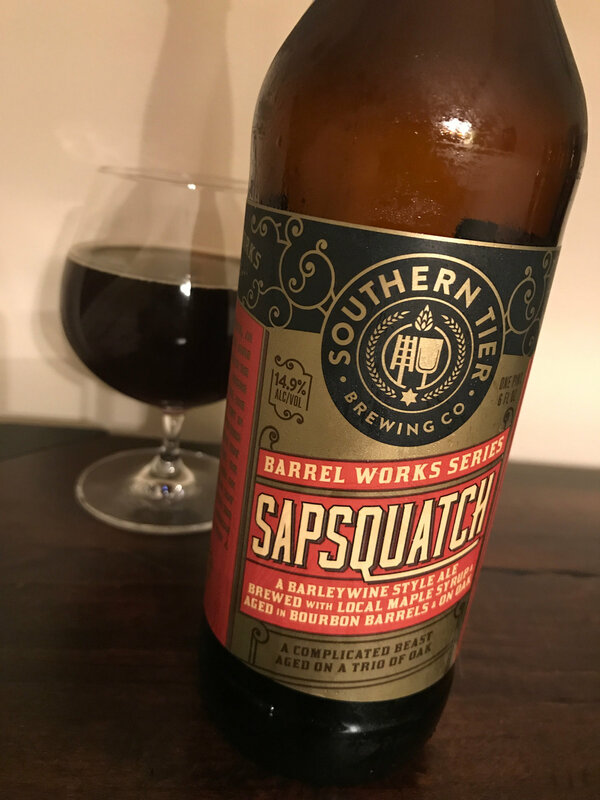 Aged for 12 months and clocking in at a healthy 14.9% ABV, it's a beer worthy of Bigfoot. Or at least something to bring on your latest squatching excursion. Beer Nerd Details: 14.9% ABV bottled (22 ounce bomber). Drank out of a snifter on 6/23/16. Bottled: April 2017. I've never been particularly in love with Southern Tier, so this was a welcome treat. It seems pretty widely available too, which is nice (I would totally grab another of these for a rainy day). There's supposed to be another Barrel Works beer called Monstrous that looks like a straightforward bourbon barrel aged imperial stout, my kinda beer. It's nice to see these folks stepping up their game (and with a minimum of gimmicky adjuncts). So there was this brewery in Denver called Former Future Brewing. They put out your standard brewery starter kit of beers, like IPAs and porters and whatnot, but they had this top-secret, backroom operation where they were experimenting with capturing native microflora and yeasts by using coolships. Soon enough, beers from this "Black Project" started to take off... so much so that at this point, Former Future is no more, and Black Project has become the heart of the operation. Beer Nerd Details: 4.5% ABV bottled (750 ml caged and corked). Drank out of a flute glass on 6/17/17. Bottled on: ? 09 2017 (can't read that first number). Label also has "CF-CS" printed on the front too, not sure what that means. 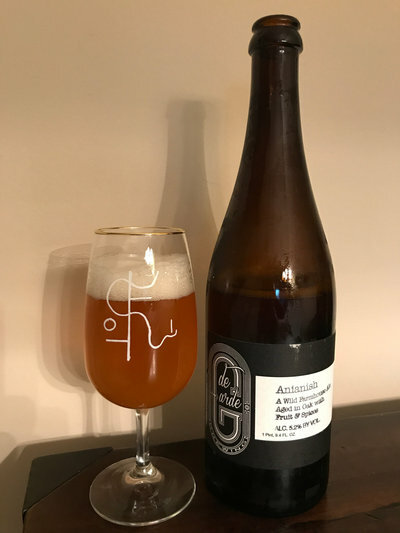 I love pretty much everything I've had from de Garde, but I must admit that I'm starting to get a sorta samey vibe from much of what I've managed to procure. Sure, those fruited Bu variants (especially the imperial ones) are making waves and are obviously diverse in terms of flavor, but there also seems to be an unending series of 5%ish tart saison/American wild hybrids that are delicious, but again, samey. This isn't the worst thing in the world, of course, and making consistent wild ales is an achievement in and of itself. Plus, as I continue to evolve as a beer dork, this sort of consistent, approachable, 5% offering is more appealing than ever. 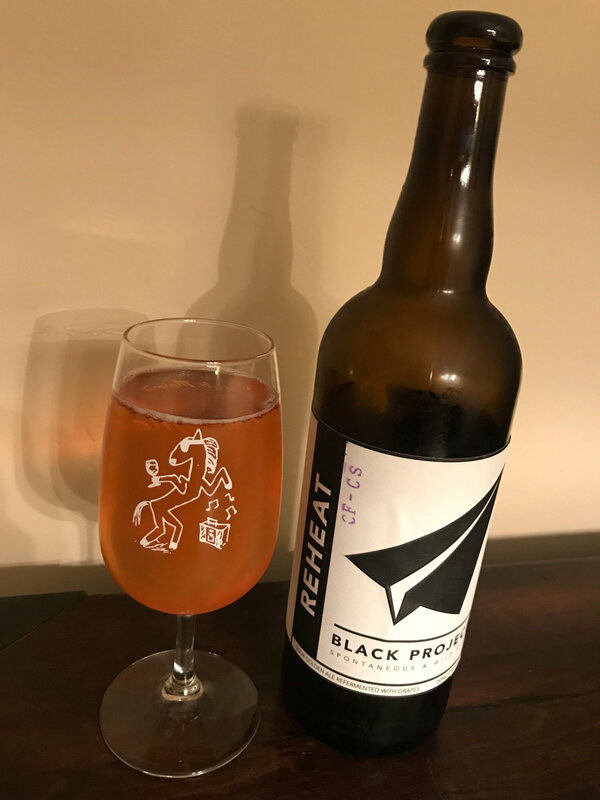 It's just a lot easier to write about something that blows your mind (or the reverse situation of a beer that is a disaster). Blogger problems, bro. Beer Nerd Details: 5.2% ABV bottled (750 ml). Drank out of a flute glass on 6/3/17. 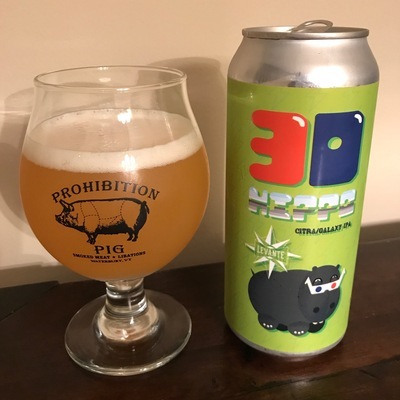 The name of this beer harkens back to George Orwell's Animal Farm, where the phrase "Four legs good, two legs bad." is used as propaganda that initially helps clarify the animals' goal to be free of human oppression, but which eventually devolves into a meaningless sound bleated by the sheep ("two legs baa-d") that only serves to shut down dissent. As the novel progresses and the needs of the leadership change, the chant is modified to the ironic "Four legs good, two legs better", which sounds similar but obviously means the opposite. Such reversals might sound silly, but this sort of thing happens all the time, even in science. For example, over-the-counter nasal docongestant sprays are effective... for about 3 days. After that, the user's continuing stuffiness and congestion are actually caused by the product itself, something called a rebound congestion. But I digress. I'm not positive why Sante Adairius named a beer after this infamous quote, but their blurb on the bottle mentions a three-legged dog, so one must assume that there is a rising tide of three-legged dogs plotting revolution in Capitola, California. And I, for one, welcome our new doggo overlords and would like to remind them that as a trusted blogging personality, I can be helpful in rounding up others to toil in their underground bone mines. And I'm digressing again. The beer itself is labeled a "Belgian-style blonde Quad" (a "made-up beer style") that is fermented in oak puncheons then aged for long periods in oak foudres. As befits the style-defying description, this was originally part of Sante Adairius's 16e series of weird one-offs, but it appears to have graduated to a regular offering. Four Legs Good, three legs better? Beer Nerd Details: 9.9% ABV bottled (750 ml). Drank out of a flute glass on 6/2/17. Batch 2. For a brewery that is as local as Levante (a place that I visit regularly) I sure haven't kept up with them when it comes to reviews. This is mostly just because I'm the worst, but also because I'm generally palling around with local beer nerds and don't really take the time to write down detailed notes (see, maybe I'm not the worst). In the year and a half since I last wrote about them, they've grown considerably, branched out a bit, and started bottling/canning beer. After working out some kinks, they appear to be dialed in on that front, as these two recent can releases were fantastic! 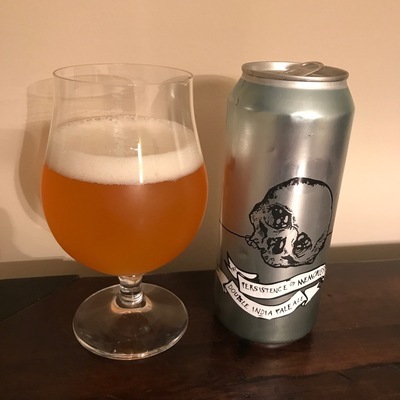 Both are Northeast IPA style beers with trendy, citrus-forward hops and they stack up favorably amongst the growing throngs of NEIPA producers in the region (and it should be noted, they still put out more typical West Coast IPA style stuff on occasion as well). 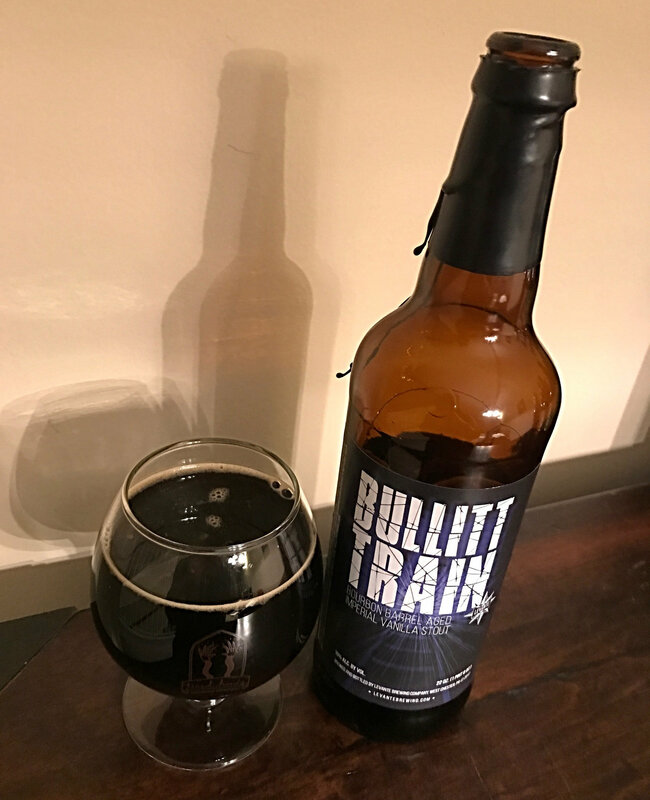 While I'm at it, I figure I'll throw out some notes on the latest iteration of Bullit Train (their bourbon barrel aged vanilla stout), because why not? Beer Nerd Details: 7.4% ABV canned (16 ounce pounder). Drank out of a tulip glass on 5/29/17. Canned on 05/24/17. Batch: MUCH LOVE! 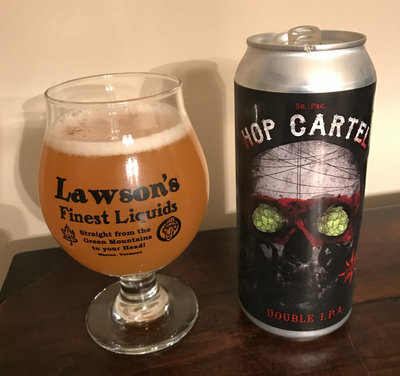 Levante South Pacific Hop Cartel - A DIPA brewed with an unspecified blend of New Zealand and Australian hops (from talking to the brewer, I believe it involves at least Motueka and Nelson Sauvin, but probably more). 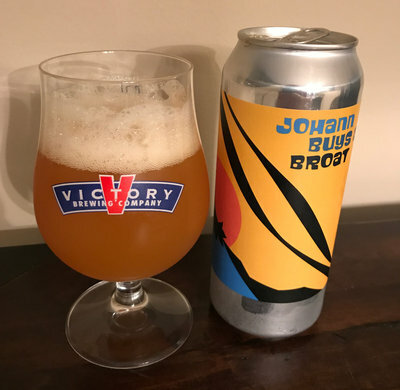 This was initially released on tap in February, and it was spectacular. Bursting with juicy citrus hops in both aroma and taste, great mouthfeel, just a wonderful beer. Beer Nerd Details: 8% ABV canned (16 ounce pounder). Drank out of a tulip glass on 2/1/17 (on tap), 3/31/17 (can), and several times thereafter, bro. On tap: 2/1/17. Canned: 03/27/17. Beer Nerd Details: 10.5% ABV bottled (22 ounce bomber). Drank out of a snifter glass. 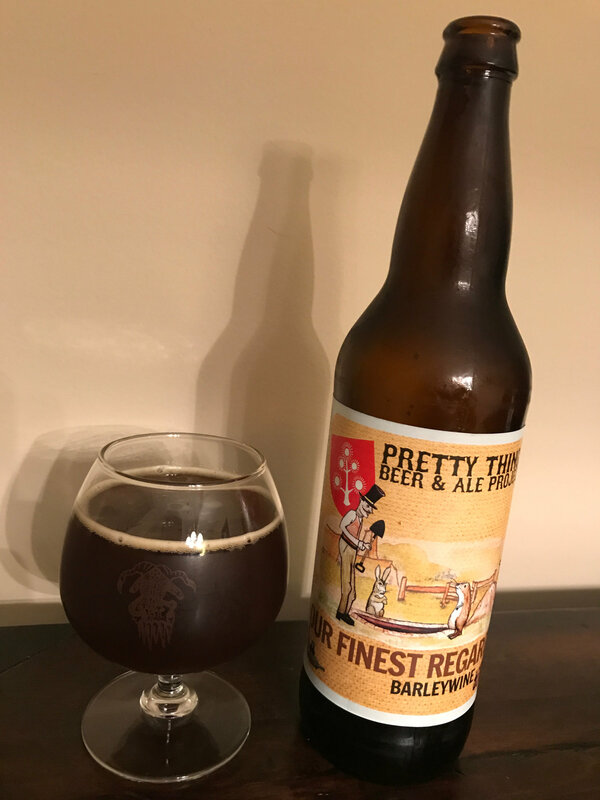 It's been a little over a year and a half since the famed gypsy brewers of Pretty Things Beer & Ale Project decided to close up shop. Despite speculation, there was no official reason given for the closure other than their note that it was never meant to be a long term thing. As gypsy brewers, their very nature meant that their enterprise was lightweight and not tied down by things like debt, equipment, or real estate. I suspect they had their fill and decided to walk the Earth (you know, like Caine from Kung Fu) basically just because they could. And why not? Beer Nerd Details: ABV bottled (22 ounce bomber). Drank out of a snifter on 5/26/17. Bottled: Nov 2015. Despite their closure, Pretty Things did put out a pale ale in the UK last year, so it's possible we'll see their return at some point. The nimble business model that allowed them to close neatly should also allow them to start up again if they so desire, but I suspect the best we'll see are limited one-off type events like that pale ale... if that. Still, a beer dork can hope. One of the leading lights of the Asheville, NC craft beer community has sold out to the Great Satan, AB Inbev, whatever shall we do!? 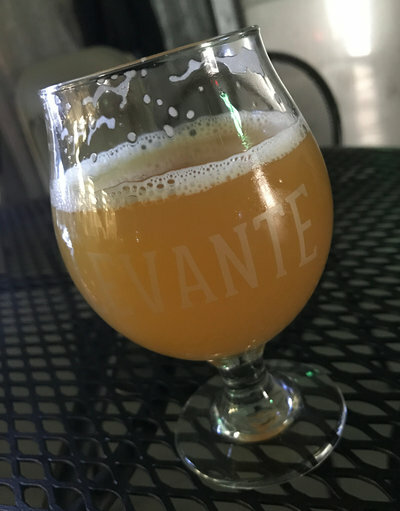 Well, Asheville is one of the most densely populated cities in the country when it comes to breweries (second only to Portland, OR), so there's no shortage of alternatives. Among them is Burial, which I've heard good things about, but only been able to sample once at a share (i.e. not exactly ideal conditions). 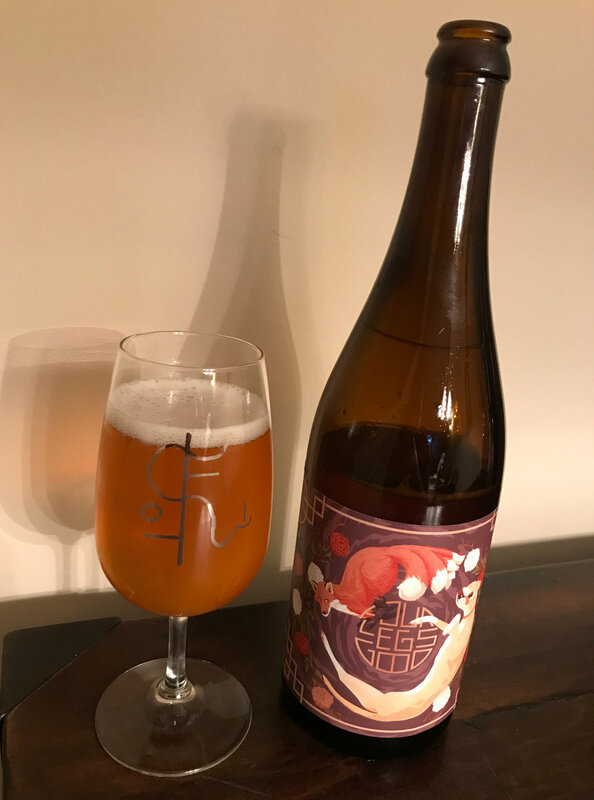 The Persistence of Memories is a Double IPA brewed with El Dorado, Mosaic, and Equinox hops, and a pretty obvious reference to Salvador Dali's famous painting. So let's brush up on our surrealism and drink some beer, eh? Many thanks to fellow beerNERD Danur for bravely exploring the environs of Asheville and snagging this can for me. I will most certainly be keeping an eye out for more Burial (and what the hey, more Asheville breweries while I'm at it). Once the darlings of the craft beer community, it seems that Dogfish Head's fortunes have been on the wane in recent years. Sure, they're still chugging along and are often the savior of a BMC dominated taplist, but their beers aren't quite as heralded as they once were. This might be due to the hit-or-miss nature of their sometimes gimmicky approach, or perhaps just plain snobbery. Personally, I tend to enjoy their more "normal" takes on beer, though some of the "off-centered" stuff hits its mark from time to time as well. I had the good fortune to visit the original Rehoboth Beach brewpub last year, and it was a really good time. I had some brewpub exclusives like Porter by Proxy and SeaQuench Ale (now a regular release) that I really enjoyed (and others that were... less successful, like Choc Lobster). Anyway, I knew that I'd squirreled away a few bottles of Dogfish Head's more extreme efforts a few years ago, so I lit my torch and made the trek into the deepest, darkest catacombs of my cellar. After fighting off a hoard of mummies and centipede-like creatures, I managed to extricate a few vintage bottles of Dogfish Head from several years of cobwebs and dust. 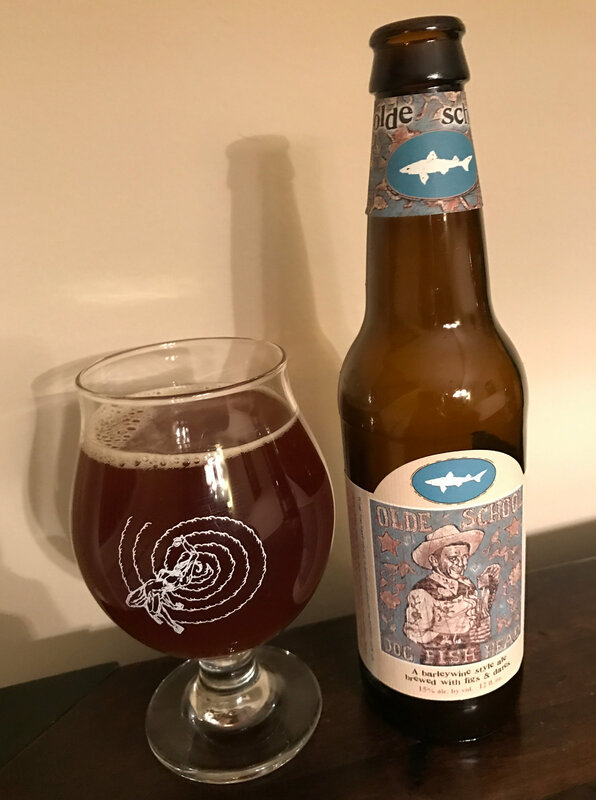 Dogfish Head Olde School Barleywine - A barleywine brewed with figs, I always found the label's "Directions" charming: "Open bottle, pour contents into two snifters. Enjoy. Or: Walk hand-in-neck into the middle of the woods. Use a shovel to dig a 2x2 hole three feet deep. Seal the bottle in a plastic bag. Place in hole & pack with dirt. Memorize location & leave. Return exactly one year later. Dig up bottle, open & enjoy." Well, I didn't pack it in dirt and I left it in the catacombs of castle Kaedrin for 5 years instead of just 1, but this still held up pretty well. I'd probably recommend a little less time in the cellar if you're looking to age your own, but it definitely takes on age gracefully. 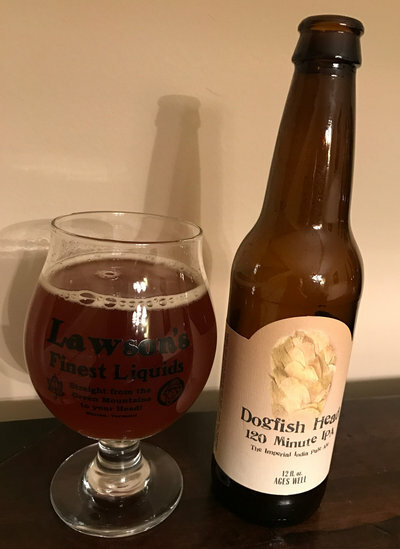 This is probably one of Dogfish Head's more underrated beers. 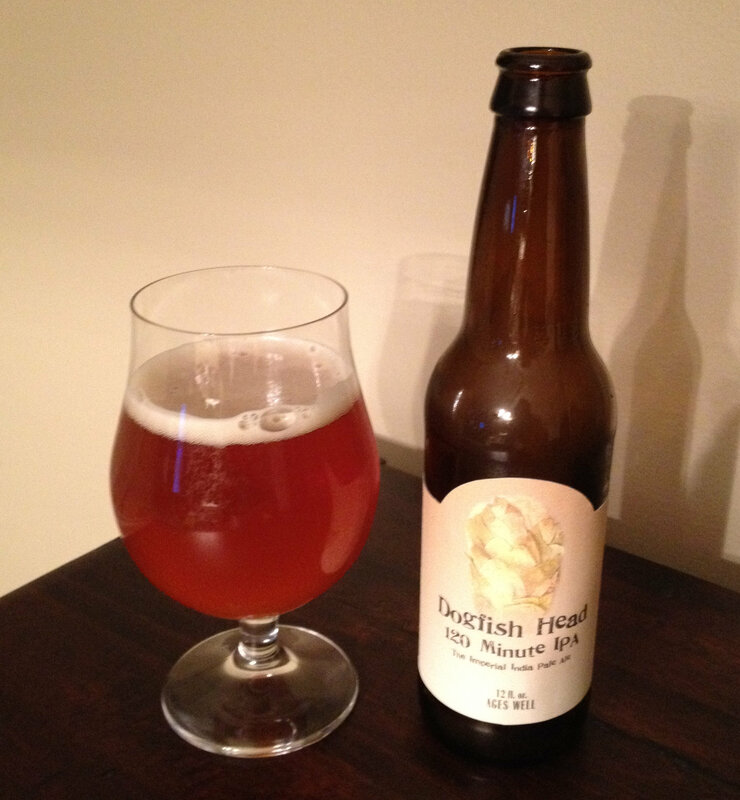 This is actually the last beer from Dogfish Head that I did a proper review for, and it's from 2012... I may need to remedy that, but for now, let's look at our well aged 4-5 year old bottle. Beer Nerd Details: 15% ABV bottled (12 ounces). Drank out of a tulip glass on 2/4/17. Bottled in 2012B. Beer Nerd Details: 18% ABV bottled (12 ounces). Drank out of a tulip glass on 2/18/17. Bottled in 2011B. 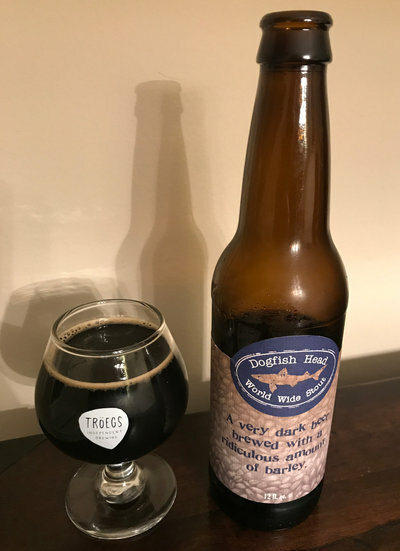 Dogfish Head World Wide Stout - Of the Dogfish Beers I've aged, I'd expect this one to do the best. It ticks all the right checkboxes for the ideal beer-aging candidate: dark malt-focused ale with extremely high alcohol, no flavor additives likely to fade too much over time (i.e. coffee, vanilla, etc...), and so on. This is the sort of beer that drinks pretty hot fresh, but ages considerably well. At 2 years old, it was a really tasty treat. With 5-6 years under its belt, it's even better. This appears to be one of the few beers that actually does get better over time. Beer Nerd Details: 18% ABV bottled (12 ounces). Drank out of a snifter glass on 5/1/17. Bottled in 2011A. So there you have it. I've depleted my entire supply of Olde School, but I still have a 120 (same vintage) left, and a 2010 WWS slumbering in the cellar. I'm guessing the WWS could take several more years before showing significant degradation, but the 120 should probably be drunk soon (and if I had Olde School, that seems to be at its limit as well). All three of these beers are good for long term aging though, and my recommendation would be to pick up a 4 pack of each, and drink a bottle every 1 or 2 years. Funky Buddha has a reputation for gimmicky sorcery and artificial flavoring. Like most things, this cuts both ways. Some of these beers are absolutely wonderful, others are less successful. 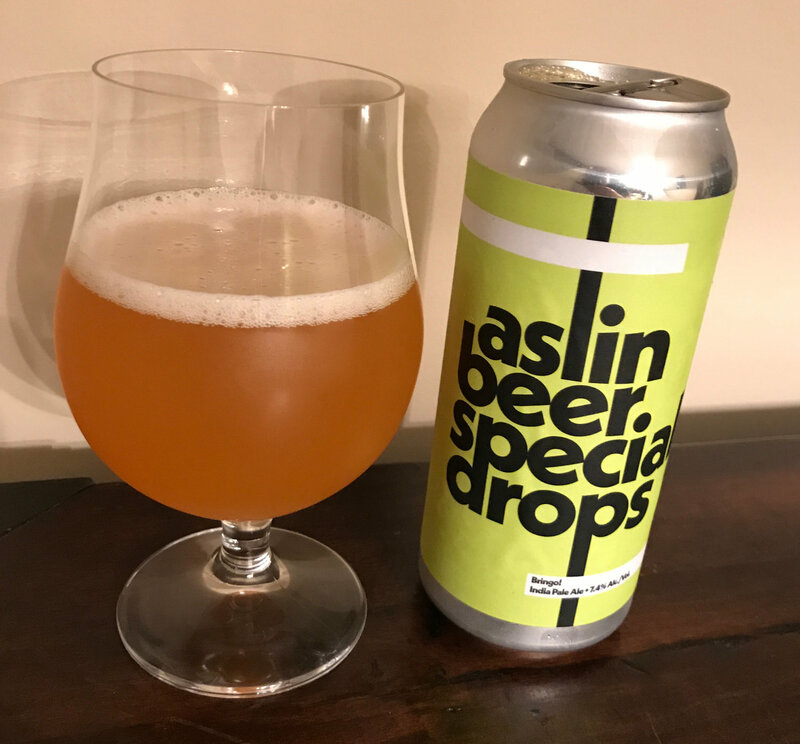 As I gather from a Florida-based friend of mine, even the great stuff can get old pretty fast, but in small doses, these can be really fascinating beers (this is something that doesn't hit me as hard, as I only get dribs and drabs once or twice a year, so it's all still a novelty to me). 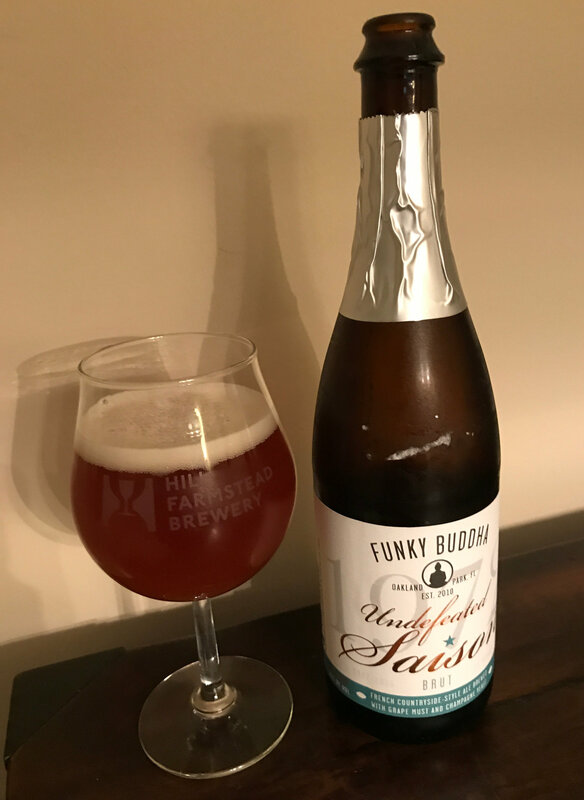 Thanks to that same Florida man, I've recently received a cache of Funky Buddha beers in the mail, so let's dive into a couple of them to see what's kickin' in the sunshine state. Beer Nerd Details: 7% ABV bottled (750 ml). Drank out of a charente glass on 5/12/17. Released: November 1, 2016. 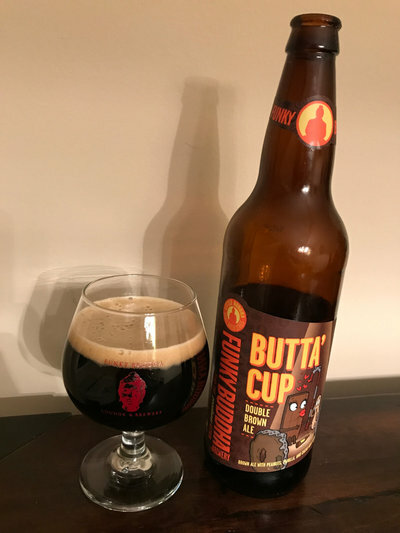 Next we have Butta' Cup, a double brown ale made to evoke, yes, the fabled peanut butter cup. No brand specified, but you know they're talking about Reese's, because what other one can you really name? I mean, yeah, sure, I know your local chocolatier has a handmade version that is spectacular, but does anyone really think about those? Did you get those when you went trick-or-treating? No. And as I've mentioned before, there's something about peanut butter beer that, while certainly gimmicky, still manages to evoke a feeling of nostalgia and warmth. Or something. So is their artificial flavoring wizardry game doing better than their saison game? Why don't you build me up, butta' cup? Beer Nerd Details: 8.8% ABV bottled (22 ounce bomber). Drank out of a snifter on 5/12/17. So a pretty good showing here, nothing to rival the best of Funky Buddha that I've had (Last Snow and Wide Awake It's Morning), but they're always interesting, that's for sure. Beer Nerd Details: 7.4% ABV canned (16 ounce pounder). Drank out of a tulip glass on 5/6/17. Canned on: 04/11/17. Batch: Bring it on. Beer Nerd Details: 9.4% ABV canned (16 ounce pounder). Drank out of a tulip glass on 5/6/17. Canned on: 04/18/17. Batch: Drumptster Shrimp. Certainly worth further investigation. Plus, you know, potential Narnia entrance. Many thanks to fellow BeerNERD Ray for procuring these cans for me.